This IBM® Redbooks® publication provides information about aspects of performing infrastructure health checks, such as checking the configuration and verifying the functionality of the common subsystems (nodes or servers, switch fabric, parallel file system, job management, problem areas, and so on). 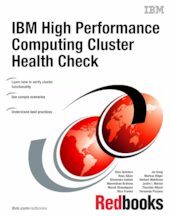 This IBM Redbooks publication documents how to monitor the overall health check of the cluster infrastructure, to deliver technical computing clients cost-effective, highly scalable, and robust solutions. This IBM Redbooks publication is targeted toward technical professionals (consultants, technical support staff, IT Architects, and IT Specialists) responsible for delivering cost-effective Technical Computing and IBM High Performance Computing (HPC) solutions to optimize business results, product development, and scientific discoveries. This book provides a broad understanding of a new architecture.